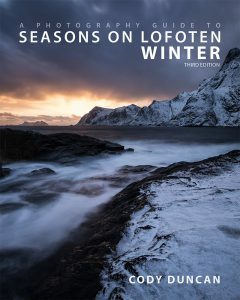 This is a photography workshop about experiencing the best of wild Lofoten in some of my favorite destinations. The workshop will officially begin in Leknes at 12:00 on Saturday, July 23 and end in Leknes at 12:00 on Friday, July 29. Please schedule your arrival as close as possible to these times. 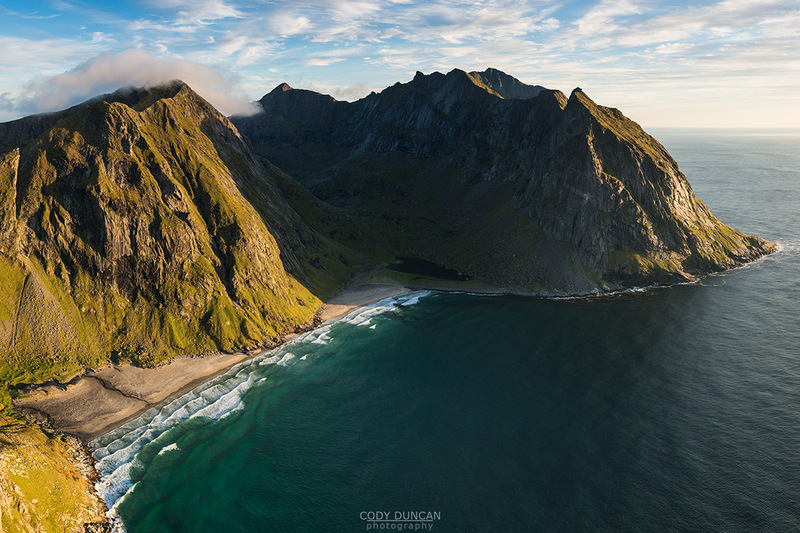 Accommodation: Our accommodation will be on Vestvågøy, in the heart of Lofoten. Camping: We will be camping on at least 3 nights during this workshop. Tents and cooking equipment will be provided. Physical Ability: Moderate to good physical ability is required for this tour. Though none of the planned hikes are overly physically demanding, we will aim to reach several mountain peaks of up to 600 meters in addition to hiking about 20km in total. 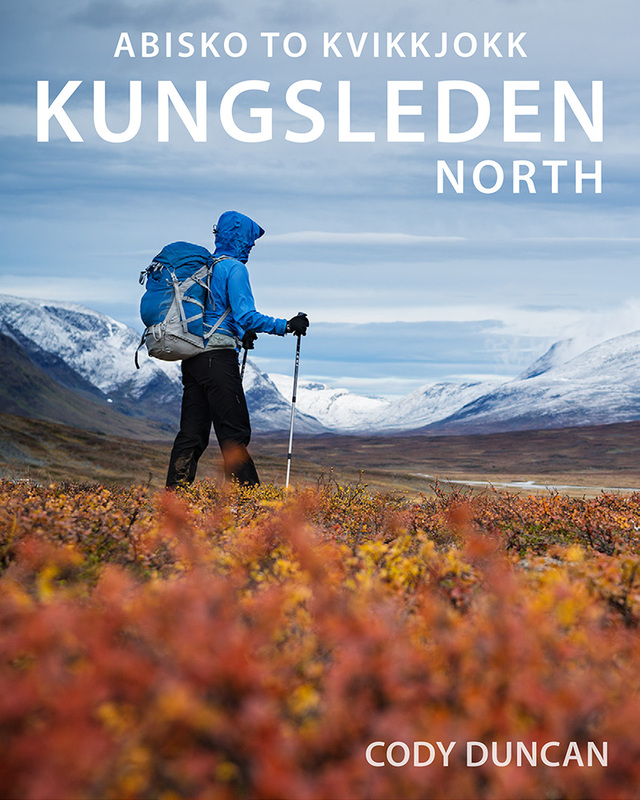 This is a hiking trip that will require a moderate amount of physical fitness, previous hiking experience, and the ability to carry all your own camping/photography equipment. Each day will consist of some hiking, the longest being approximately 8km, including a mountain pass. On some days we will also attempt to hike to a nearby peak up to 600 meters for some fantastic beach views. 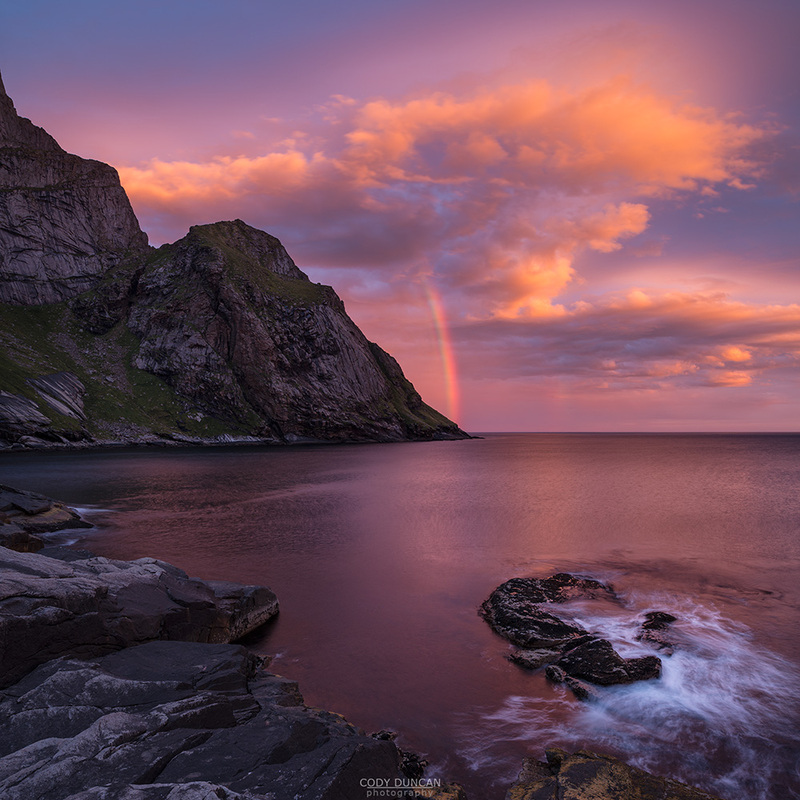 The nature of Lofoten requires a great deal of flexibility to the local weather conditions once on the Islands, which is why I have added a few ‘buffer’ days into the trip. Ideally we can complete the hike in one journey, however, if the weather says otherwise, we will have transport available to split up our planned destinations into two segments if necessary. Accommodation will be reserved for the entire duration of the trip, allowing us the greatest flexibility possible. 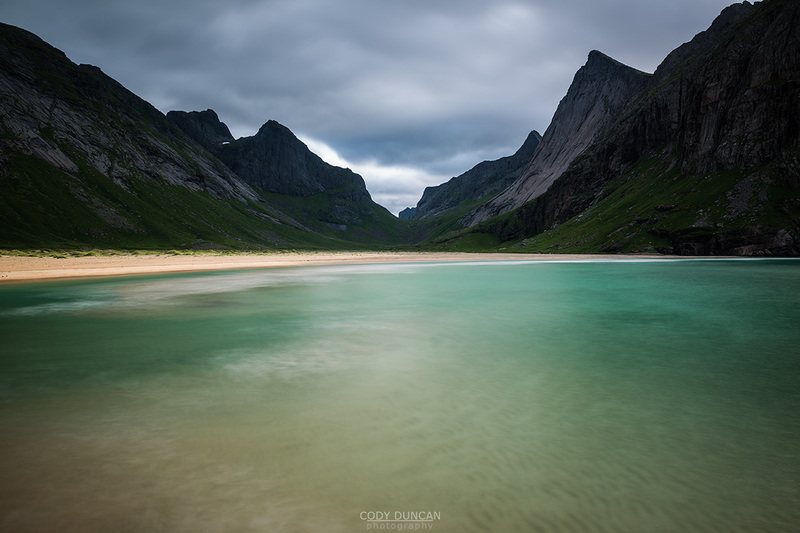 On days that we are not hiking/camping, we will visit some of the roadside highlights of Lofoten, including the beaches of Vestvågøy and Flakstadøy. 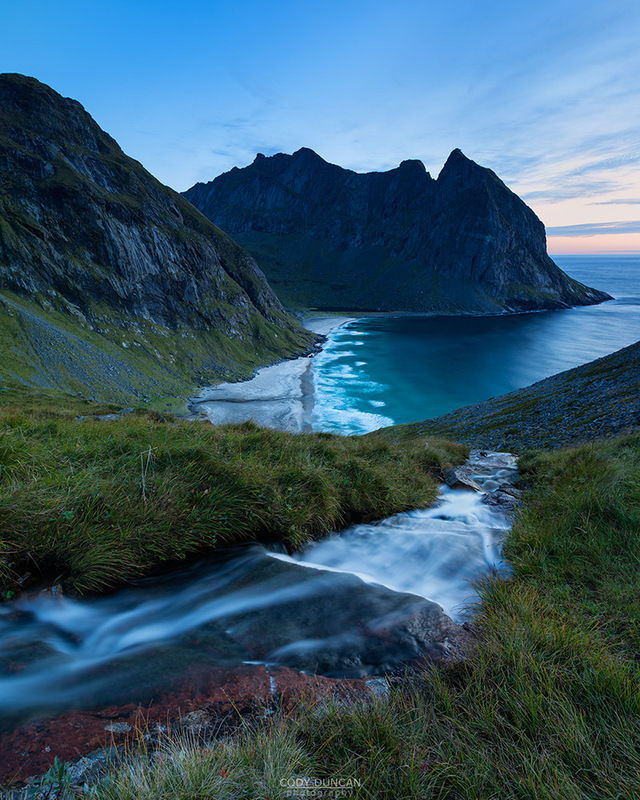 Additionally, we will take in the fantastic views around Reine and Hamnøy. You will be picked up in early afternoon in Leknes. We will first head to our accommodation to drop off baggage and discuss packing options for the hike. We will be dropped off in Reine, where we will catch the ferry to Kjerkfjord and begin our hike to Horseid beach. 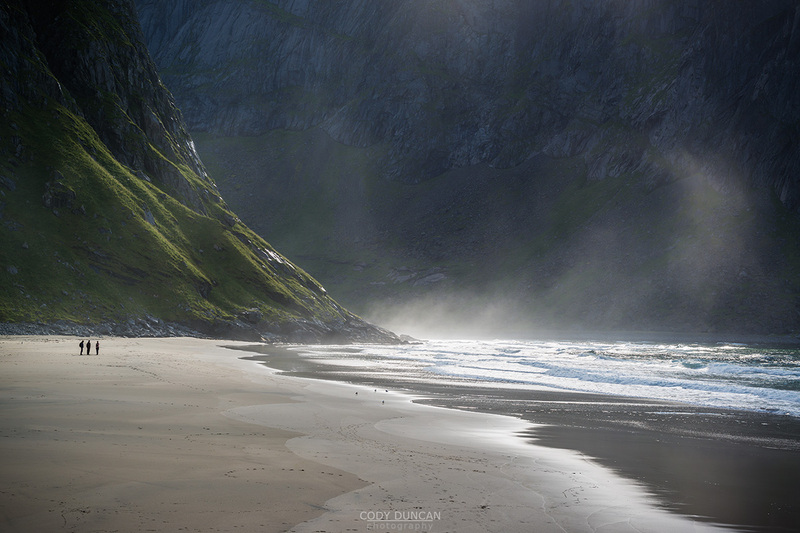 This is one of Lofoten’s most wild and secluded destinations, which is among my favorite places on the Islands. We will camp here on the first night. Leaving Horseid, we will ascend a mountain pass on our way to Selfjord. Weather permitting, we will attempt to camp in the mountains, which leaves us several small peaks as possibilities for sunset/sunrise. Otherwise, if the weather is poor, we will continue to Selfjord, where we have the option of staying at a DNT mountain hut. From Selfjord, we will be picked up and driven several kilometres to the trailhead for Kvalvika beach, which we will then hike to for the night. Weather and legs permitting, we may attempt a hike to the summit of Ryten for late afternoon and twilight light over the beach. 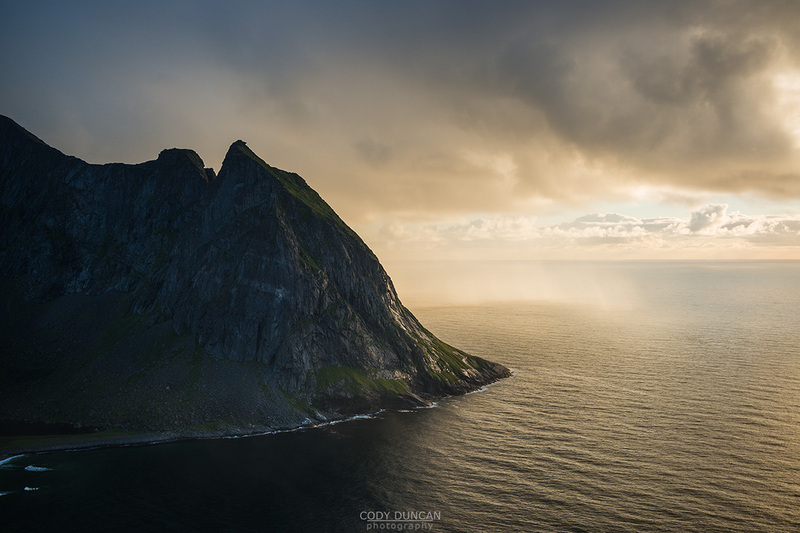 If we haven’t climbed Ryten on the previous day, we will attempt to do so on our return to Fredvang, where we will be picked up and brought back to our accommodation on Vestvågøy. We will tour some of the highlight of Vestvågøy and beyond. 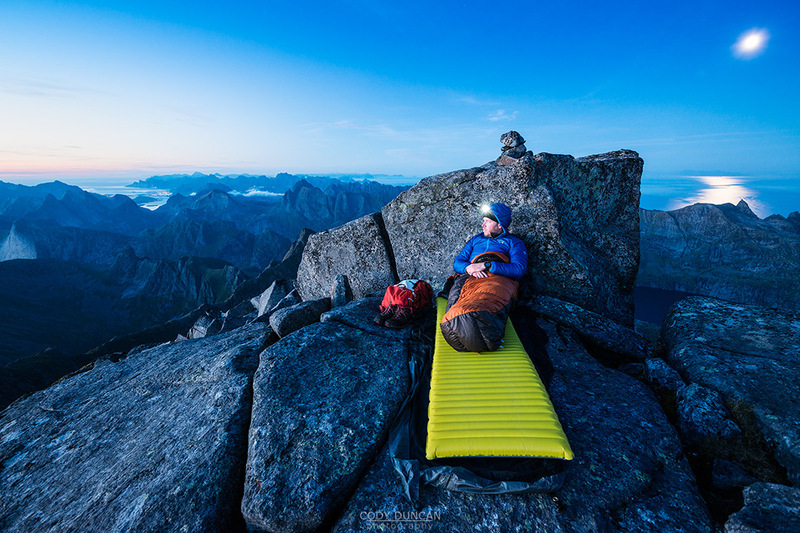 Accommodation and Tents – All accommodation on Lofoten as well as tents will be provided. Our accommodation will be reserved for us the entire duration of the trip, giving us the greatest flexibility for making the hike. No single supplement available, tents will be shared between 2 people. Camping Stove: Cooking equipment will be provided for while on the hike. All transportation on Lofoten, including Leknes airport pickup and drop-off in passenger van. You will need a backpack or camera bag which is suitable for multi-day hiking. This means it needs to contain all your camera gear, in addition to all camping supplies and food for up to 4 days. I often utilize a 2 bag system, of a smaller camera bag which fits inside a larger hiking backpack. This allows me to only carry the camera bag when focusing on photography or short trips up nearby peaks. 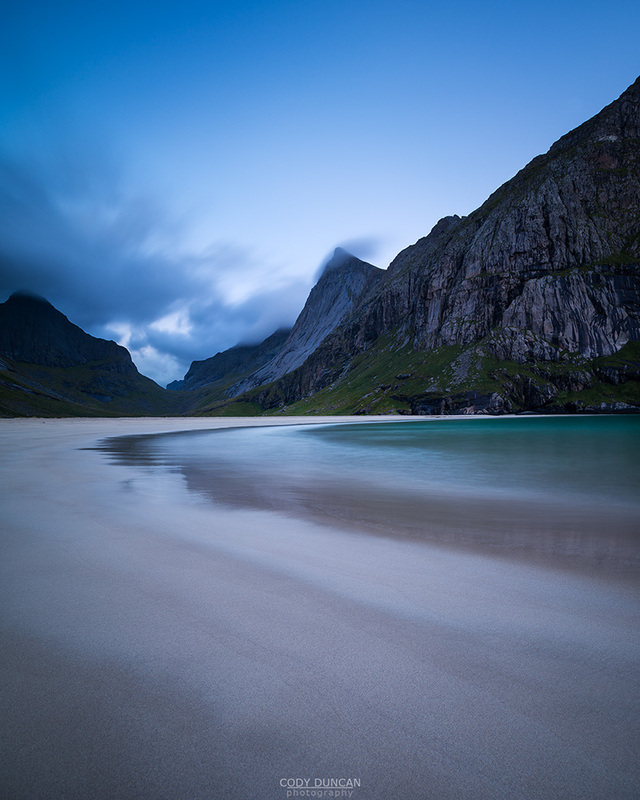 The focus of this workshop is the explore Lofoten’s scenic and wild mountains and beaches. While I will do my best to avoid as much bad weather as possible, we will likely end up with rain at some point. You will need to be fully waterproof (upper and lower) as well as having enough insulation to handle potentially cool, damp conditions. 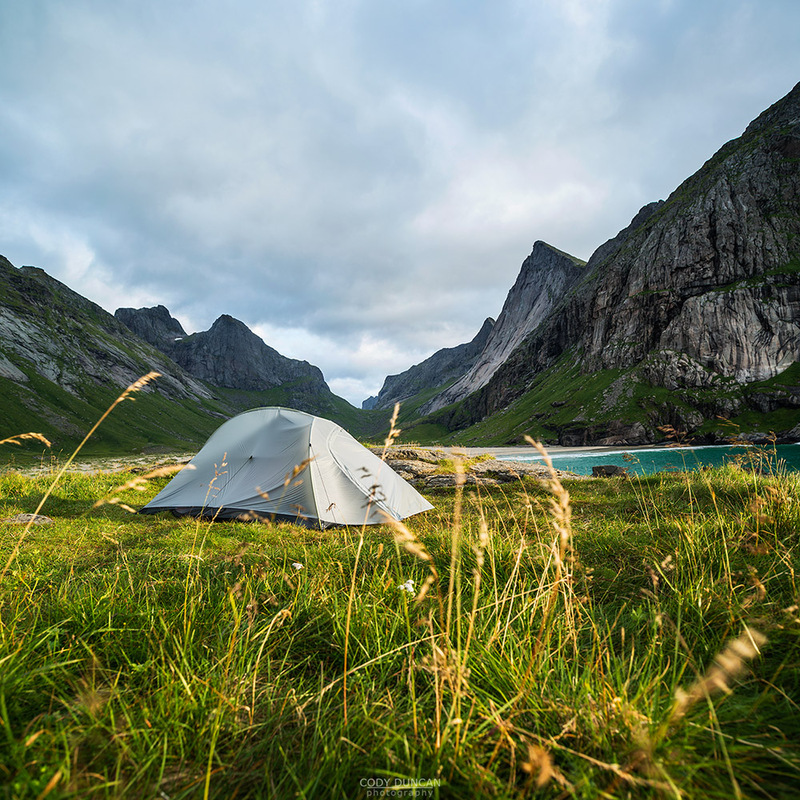 As we will be hiking and camping for consecutive days, you do not want any overly heavy clothing and your rain jacket should be separate from your insulation layer.